Sometimes one division in a company can drag down others - that’s what is happening at Toshiba, where the NAND flash business is booming, but the conglomerate faces a multi-billion dollar write-down over issues with the Westinghouse nuclear power plant. Analysts at Mirae Asset Daewoo Securities say Toshiba leadership is considering spinning off the memory business as soon as possible (by the end of March) and Western Digital is reportedly the frontrunner to scoop up a 20% stake. WD (which acquired SanDisk recently) is currently third in the global NAND flash market (with a 17.1% share) after Samsung (36.6%) and Toshiba (19.8%). However, WD and Toshiba combined would surpass Samsung’s market share, putting the new company in the lead. Make no mistake, Samsung’s memory business is a big part of how the company posted better than expected Q4 results even after it lost billions on the failed Note7. SK Hynix, known for its RAM chips (used in both computers and phones) is currently fifth in the marketplace and is the other company reported to have interest in Toshiba’s NAND business. The two companies have worked together before to develop Nanoimprint lithography. 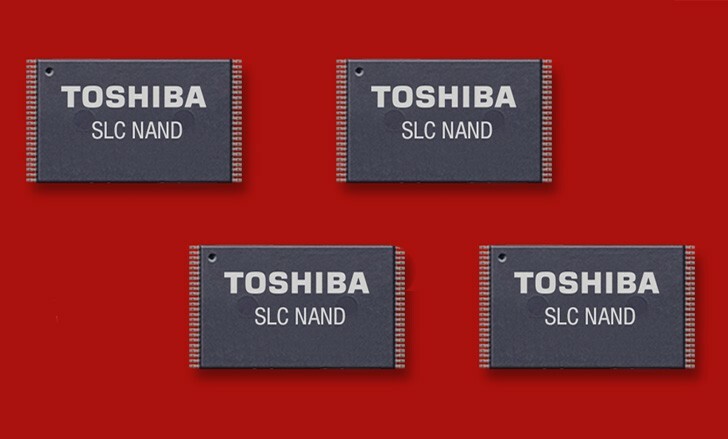 Toshiba is also set to transition to 64-layer 3D NAND in the first half of this year. The current process stacks only 48 layers, so we’re due for an increase in capacity. Samsung is also just switching from 48 to 64 layers for its NAND chips.